We welcome you to be a part of Ladies Sodality! 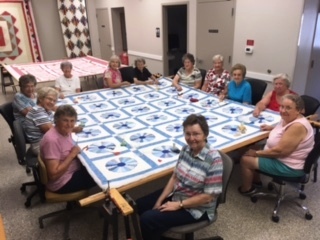 St. Peter Ladies Sodality is an organization of devoted volunteers who dedicate our time and talents to many needs of the parish. We provide service and assistance to the parish by providing volunteers, holding fund raising activities for donating to parish causes. The Sodality provides an opportunity for the ladies of the parish who participate in its activities to socialize, fraternize, and become an active member of our parish family. We welcome you to join us on our meeting days! March or April – during Lent, on a Friday evening. Mary’s Way of the Cross. May – First Wednesday, evening. May Crowning, salad supper, business meeting. September – Second Sunday. Sunday 7:30 morning Mass attendance, breakfast, business meeting. October – First Wednesday, evening. Card Party and Game Night. November – First Sunday. Sale a Rama, holiday crafts and gifts event. December – First Wednesday, evening. Potluck, business meeting, Christmas donation project. Funds from membership dues and proceeds from the annual October Card Party and Game Night are donated to St. Peter Parish to support purchase of altar bread, church laundry, and other necessities pertaining to the Holy Sacrifice of the Mass. Sodality women also maintain the sanctuary and sacristy by volunteering to wash and repair altar linens, priests’ cassocks, and cleaning of the chapel and church. Technically, all ladies of the parish family are members of St. Peter Ladies Sodality. Although sometimes only about 20-40 actively attend meetings, there are so many ladies who participate in parish events, groups, committees, and volunteer opportunities. Annual dues are $3.00, preferably paid no later than March 31. There is an envelope in the January packet. The first Wednesday evening in October, friends gather in Selinger Centre enjoying Card Party and Game Night! Donations are received for raffle tickets, giving you a chance to win a beautiful quilt or other gift donated by members of Ladies Sodality and local businesses. For the cost of your admittance ticket, tables and chairs, cake, coffee, tea, and the ever-popular attendance prizes are provided. In order to make this annual Ladies Sodality fundraiser a success, parishioners are requested to bake a cake or donate a gift for attendance prize. Card Party and Game Night is a fun evening – for those attending, playing cards, and for the many volunteers! Sale a Rama! This annual holiday craft and gift show is held in Selinger Centre the first Sunday in November, featuring country store, snack bar, raffle tickets for beautiful quilt, booths: jewelry, sewn items, doll clothes, kettle corn, holiday crafts! Event planning for Sale a Rama Committee begins in July. Members organize the event, contact vendors who might be interested in hosting a booth, recruit volunteers, seek donations of quilt and prizes, and arrange publicity. Country store and snack bar committee requests donations of homemade cookies, jelly, brownies, plants. Sale a Rama is THE major fundraiser of Ladies Sodality. The first Sale a Rama was held in 1977. Throughout these many years, Sale a Rama proceeds have contributed money towards St. Peter Capital Improvement Fund; bell tower repair; Selinger Centre restroom remodel; new carpet and vacuum system, and repair of stained glass windows in church; renovations in the Chapel; and purchase of card tables and chairs for Selinger Centre. Special thanks to the Sale a Rama Committee, to the quilters for their time and talent to make the beautiful quilt which is raffled each year, to the volunteers in the Snack Bar and Country Store, to all the ladies who work at the door and at the quilt raffle table, and to all who help set up, take down, and clean up. Sale a Rama would not happen, would not be a success, without all of you! Many volunteers work hard to make the event possible. And, thanks also to the parish, for your support of Sale a Rama, by your attendance and donations! This is always a wonderful day. Please join us in attending this yearly event, or volunteering with the dedicated and delightful Sale a Rama Committee. One of the most compassionate activities of Ladies Sodality is hosting, providing food, and serving meals for family members and friends following a deceased parishioner’s funeral. Two ladies serve as monthly chairpersons. They and other ladies (and sometimes husbands) help set-up, prepare food, serve, and clean up. A calling committee, phones volunteers, who kindheartedly prepare and bring food entrees. This is a most-rewarding service that Ladies Sodality members provide to our parish. How appreciative those families are! Most times when you are helping at a funeral dinner, at least 4-5 family members will come to talk with the volunteers, expressing their gratitude for hosting the dinner! This service is provided without charge to the family; however, donations are frequently given, and greatly appreciated. Most times, Ladies Sodality and Holy Name (the St. Peter men’s association) are the first groups to be called to help at parish receptions and events. If you would like to meet a terrific group of members of our parish, who work together and truly make a difference in our parish, join and participate in Ladies Sodality and Holy Name. With annual membership dues of $3; with proceeds of Sale a Rama and Card Party; and with monetary donations from families, in thanks for ladies hosting funeral dinners, Ladies Sodality is fortunate to contribute monetarily to St. Peter Church. Ladies Sodality is all about STEWARDSHIP! Giving of our time (helping with church-related activities) and talent (donating money to church). Each of us has been blessed by God with certain gifts and talents, and we are called to give back a portion of these blessings in thanksgiving for what we have. We invite you to be a part of Ladies Sodality, a group of people who enjoy working together in lasting friendships, in service to our parish, in thanks and gratefulness to God for all that He has given to us.